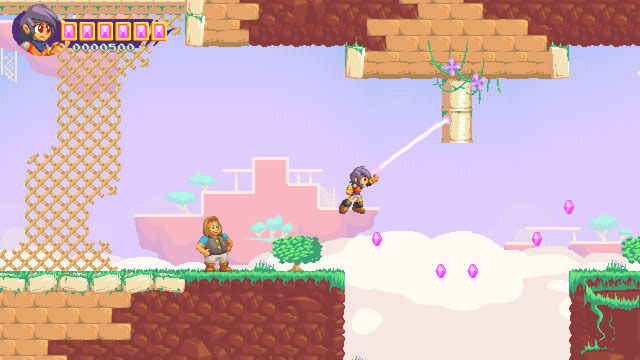 Grapple Force Rena, from Tim Ashley Jenkins and GalaxyTrail (the developers behind Freedom Planet), was originally an experimental exercise in developing a serialized browser-based grapple-platformer, but has since switched over to the more traditional full game release as a downloadable title. In this game, you take on the role of Rena, a girl with magical grapple bracelets that let her, well, grapple onto stuff. She uses this ability to swing around the environment, snag enemies to toss them into one another, and even use enemy projectiles against them. Gameplay mixes combat with puzzle platforming and even some vehicle sequences to keep players on their toes, and punctuates the experience with some larger-than-life bosses. The game offers simple yet colorful visuals to create a cartoony world reminiscent of 16-bit classics. The game is coming to PC, Mac, and Linux via Steam on December 4. A browser-based demo is available on the developer's website.